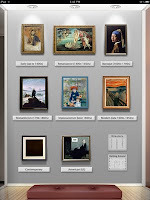 ﻿ Art Authority is is a virtual museum filled with works by over 1,000 of the western world's greatest artists, with over 50,000 images of paintings and sculptures from ancient times to today. 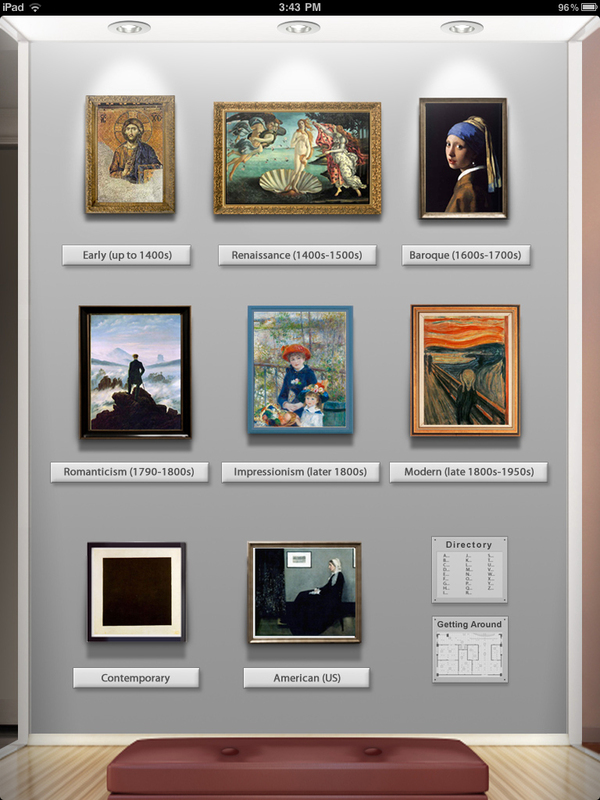 Part art reference tool, part visual feast, this app will dazzle you with its voluminous art catalog and ease of use. You enter the museum facing a wall (figure 1) with eight framed paintings, each representing a specific period in art history. Tapping any of the paintings takes you to another room where each period is then divided into sections based on geography or genre. I tapped on “Baroque,” which ushered me in to a room with a terra cotta colored wall and a roped-off piece of period furniture (figure 2). 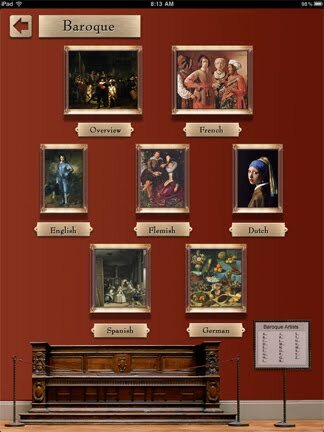 Framed on the wall are seven paintings with plaques, six representing different countries, with a seventh titled "Overview". 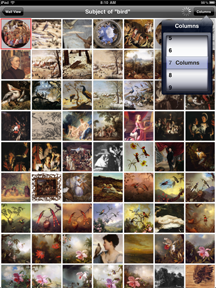 The Overview menu gives you information about the period, lets you view major works from the period, shuffle and view all the Baroque works in the database, and/or view a timeline of the period. I tapped on "Dutch" and a menu of Dutch Baroque artists popped up, then I tapped on Vermeer. 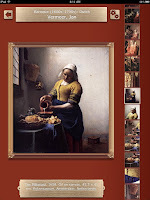 Once in the Vermeer room, a framed painting, The Milkmaid, is displayed (figure 3), along with its title, date, size and medium. 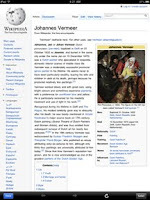 On plaques above and below the painting there are links to Wikipedia information about the artist (figure 4), the Rijksmuseum in Amsterdam where the physical painting is housed, and about the painting itself. 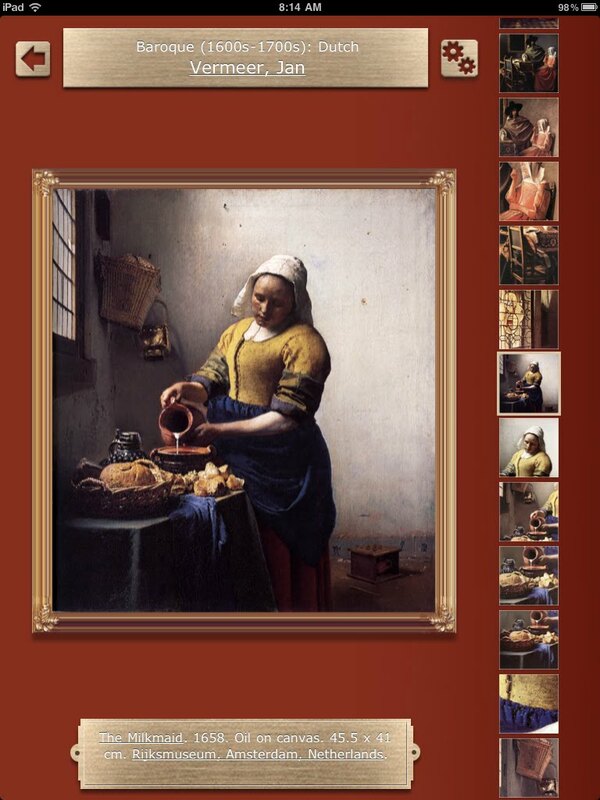 There is a scrollable filmstrip on the right that lets you browse and choose Vermeer's paintings or you can flick sideways through them, one to a page. You can also change the display to view them as thumbnails or a slideshow and even add music if you like. You can view the paintings full screen or zoom in for details (figure 5). ﻿Leaving the Baroque behind and going back to the main screen, I tapped on the directory which lets you search the entire database in a variety of ways. 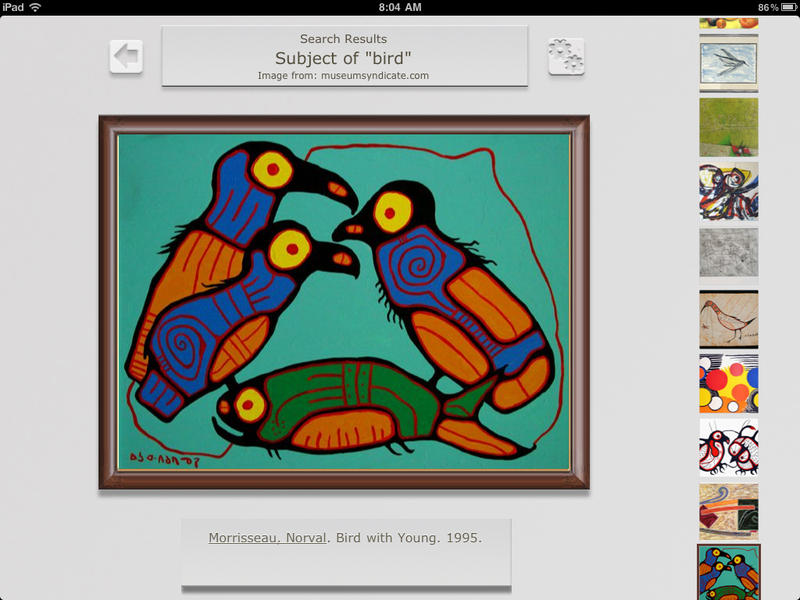 I decided to search by subject and tapped on “birds.” The search results can be viewed in a variety of ways including thumbnails (figure 6). 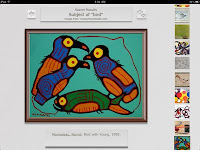 I randomly tapped on a brightly colored painting done in 1995 by Norval Morriseau, Bird with Young (figure 7). Next I did a search by location and typed in Pasadena, CA where I live and work. The Norton Simon Museum came up and I went in to browse. I had forgotten about the shockingly green portrait of Van Gogh's mother from their collection (figure 8) until it nearly jumped off the screen at me. Other features include slideshows, shuffle, timelines, a “Ken Burns” motion effect and the ability to save work to Favorites or the Photos app. Most of the work displayed is in the public domain and downloaded to Art Authority's servers. For more recent works still under copyright, Art Authority downloads from an authorized Web site instead. On the down side, not every artist you want to know about is included. For instance -- I visited the campus of Pomona College over the weekend to see Mexican muralist Jose Clemente Orozco's mural Prometheus. Art Authority has a Muralism room in its Modern section which includes work by Mexican muralists Rivera and Siqueiros, but nothing on Orozco (or Tamayo). The Contemporary section seems very hit-or-miss to me as well. That having been said, Art Authority’s value far outweighs any limitations it may have. I refer to it over and over again and often get lost browsing, discovering and learning. 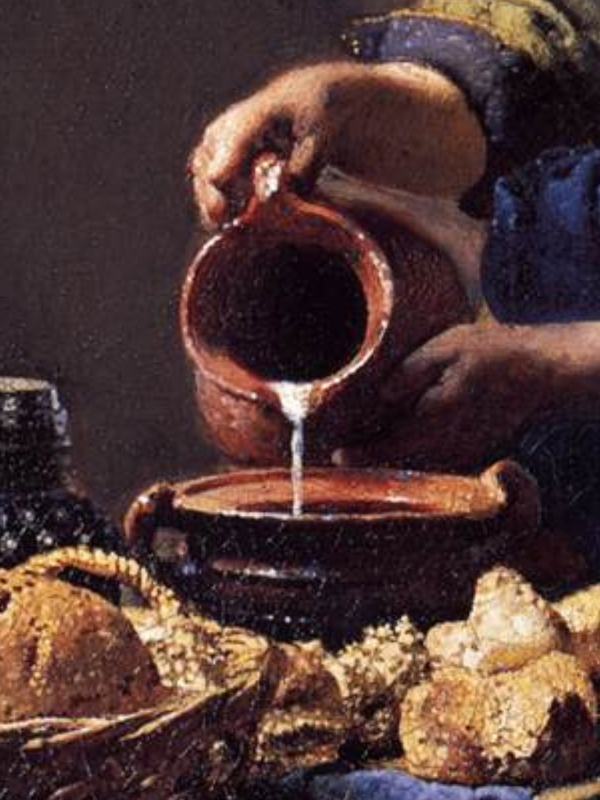 I highly recommend Art Authority as an invaluable reference tool -- for students of art history, artists and art aficionados alike -- that will provide endless hours of art education and enjoyment. 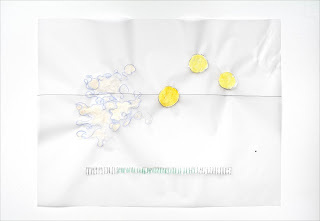 Click here to buy Art Authority.